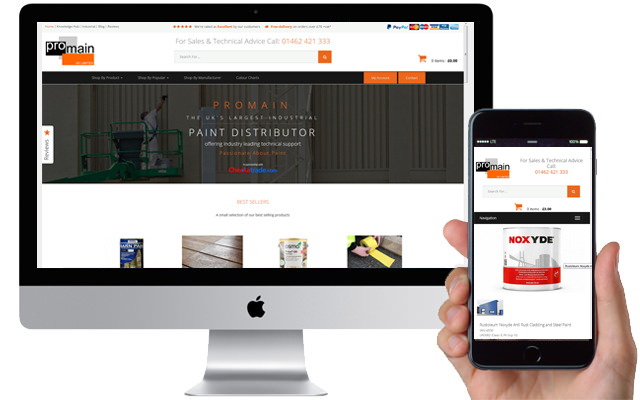 Promain are approved distributors for many of the world's leading paint and surface coatings manufacturers including 3M, Rust-Oleum, Sika, Ameron, Sigma, (now PPG), Bedec, Jotun, Classidur, Owatrol, Blackfriar, Osmo, Tor, Sherwin Williams, Mapei, Protectakote, Bollom Intumescent coatings and many others. We pride ourselves on our knowledge of the materials and technologies available in the paint and surface coatings industry. We offer a unique and professional service by helping companies and individuals find the correct paints, surface coatings and concrete repair materials for their needs. During the past 30 years Promain has become known for its friendly and dependable service by many blue chip clients including The Metropolitan Police, many County Councils and Local Authorities. We are committed to provide a professional level of service and commitment. If you feel there is any way we could improve the service we provide or improve our web site or have any comments about the products we provide we would be pleased to hear from you. New customers can register and order online. Please do not hesitate to call 01462 421 333 for technical advice or prices - we will be pleased to help you.